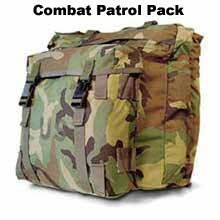 This roomy MOLLE Patrol Pack is the one you can depend on for many a mission. Main compartment has two separate compartments. Large compartment has two cinch ties to keep gear organized. Velcro closeable slit on top left shoulder for hydration or antenna. Internal vertical pull ties on each side to adjust pack height and compress sack when not full. Main area is about 15w x 4d x 15 h. Front pouch 11h x 11w x 4d. Weighs 1 lbs., 8 ozs.